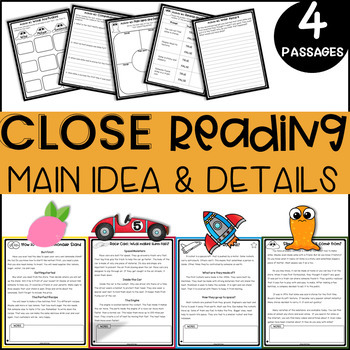 A FULL MONTH BUNDLE of Close Reading Units for Main Idea and Details for First and 2nd Grade with Comprehension Questions and FIVE Activities. It's an engaging original text that comes in two reading levels each for differentiation. NO-PREP! Just print and teach. INTERACTIVE NOTEBOOK for Close Reading! Take a look here! 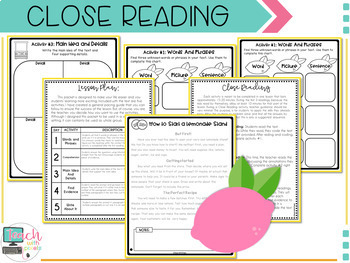 See more Close Reading Units HERE! This is a Close Reading Unit for the WHOLE MONTH designed with 1st and 2nd graders in mind. 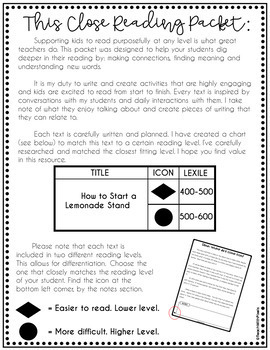 Students will read a short text, code it, and complete five activities. The activities are focused on the standards about Main Idea and Details. Students need to use the text to find evidence in order to complete the activities. ↠Text Titles: How to Start a Lemonade Stand, Race Cars: What makes them fast?, What are Rockets? and Slime: Where did it come from? 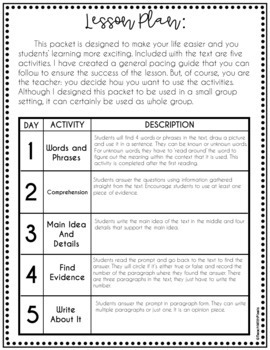 ↠Five Activities on each set: Words and Phrases; Comprehension; Main Idea & Details; Find Evidence; Write About It. Each set includes the same type of activity but with different questions and prompts. This bundle is a whole month's worth of close reading activities with text. I included a suggested pacing guide to deliver the lesson in 5 days (each set). But you can adjust the length and the pacing of the lessons. Each individual activity should take about 15-20 minutes. ↠ Each unit is 1 PDF File with 13 pages.